April | 2011 | ohdenny. After holidaying in Malaysia for around three weeks late last year, and after eating Ice Cendol and Ice Kacang nearly every single day. I wanted to make these green jellies myself. So my mother found a recipe she wanted to try and it was on this website that I am unable to find now. 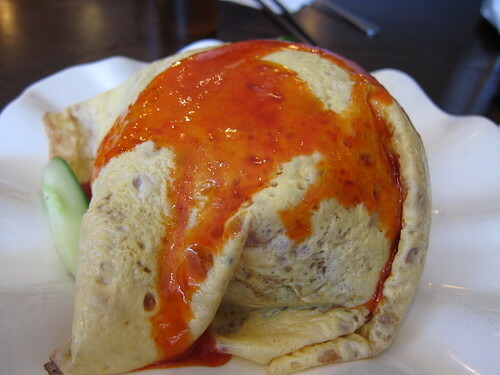 Luckily, I saved the recipe but I cannot give my thanks to the Indonesian site for their recipe. It’s actually quite simple but pushing out the dough to make the worms is quite tough if you don’t have a cendol mold. We just used a strainer and it didn’t work out too well and took ages to push it all through the pasta strainer but we just had to use what we had in the kitchen. 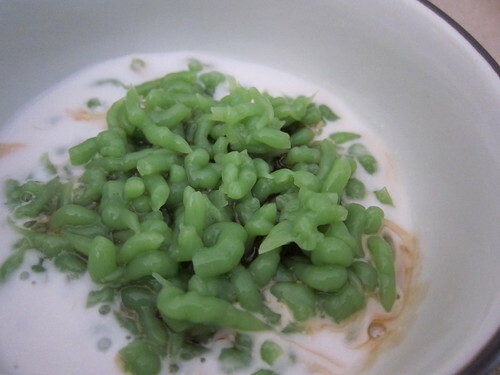 Might have to go buy the cendol mold when I get the chance to go back to Malaysia because it looks much easier with it. 1. Bring 425 ml of the pandan leaves water to boil. 2. 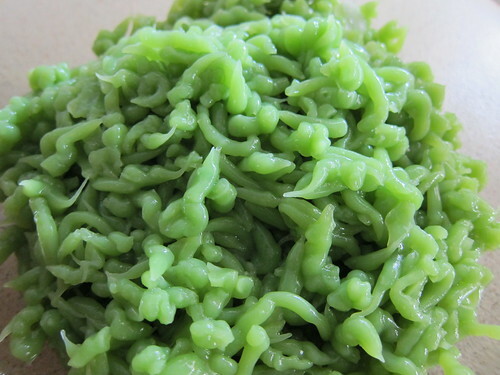 Meanwhile, mix mung bean flour, rice flour, tapioca flour, salt, sugar, and the rest (200 ml) of the pandan leaves water in a bowl. 3. Pour the mixture into the boiling pandan leaves water. 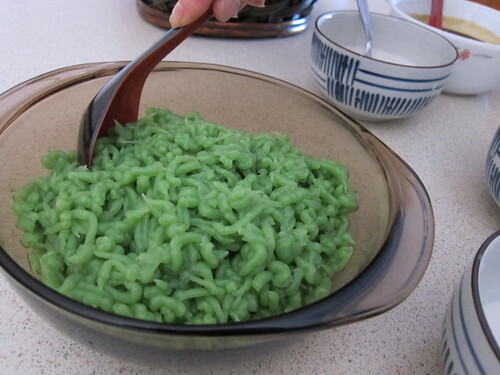 Keep stirring until the mixture co-mixtures with the pandan water. 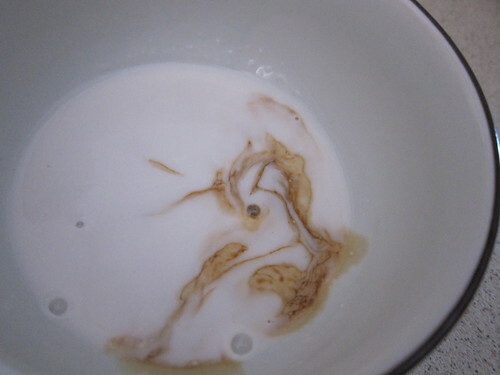 Turn the heat off when the liquid thickens and forms a transparent colour. 4. Prepare a basin filled with iced water (1/2 basin). Put the mold on top of the basin. It is easier when the diameter of the basin is more or less the same with of the basin’s. 5. Pour the jellies liquid in the mold, press it. The liquid soon becomes jellies when it gets into the iced water. Continue pressing until no liquid is left. 6. Set aside. Let it for some time to give a sufficient firmness. When it is firm enough, drain it. 1. Meanwhile, bring the coconut milk, salt and the pandan leaves into boil. Do not leave unattended as over heated coconut milk will be ruined. 2. Immediately turn off the heat once the surface is starting to raise. 1. Boil the palm sugar, water, and pandan leaves. Strain if necessary; sometimes they are not well strained in the making. It was really tasty and you don’t really need shaved ice, ice cubes will do just fine. Homemade cendol is always nicer then those you can buy, they are usually a bit too sweet and too hard and stale. You can even have cendol warm since it’s getting colder and closer to winter. Lindt, famously known for all things chocolate have opened two stores in Victoria in the last couple of years. 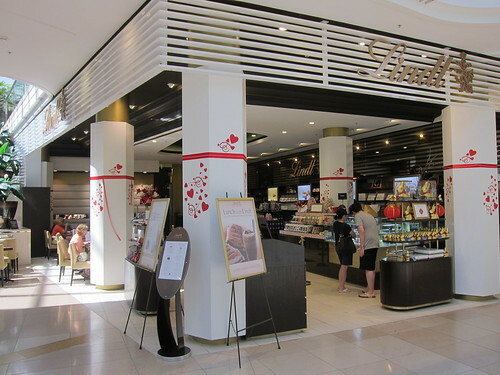 Situated inside Chadstone, the fashion capital, I believe this is the second Lindt Cafe in Victoria after the first one opened on Collins St in the city. 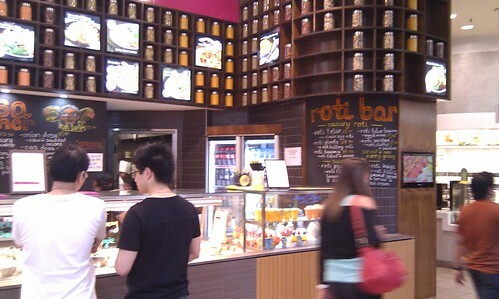 It doesn’t look as impressive as the City one as it has that ‘I’m in a shopping centre not a cafe’ feel to it. Alas, it’s the closest one around for the South East Melburnians. As a lover of all things macarons, I had to try them. Obviously. I’d tried them before when my cousin came to visit in October, I tried the Champagne Vanilla flavour and it was good. Not too sweet and the cream filling was quite nice. 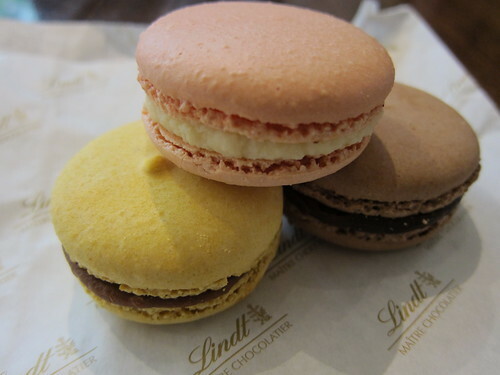 I think the yellow one was a Salted Caramel, the brown one was Hazelnut and I have no idea what the pink one was. Strawberry maybe? with a vanilla filling? My memory is already fading. Salted Caramel was pretty good because it’s not overly sweet like some macarons can be, it has a slight bitter tinge to it that I quite enjoy. I think the hazelnut macaron was a let down, I haven’t had a strong hazelnut flavoured macaron yet so I’m still waiting. Unless I make a spectacular one. Jokes aside, Lindt Cafe have a tasty selection of macarons, like Pistachio and Passionfruit but none of them stray to the odd and strange side like Zumbo’s creations in Sydney. 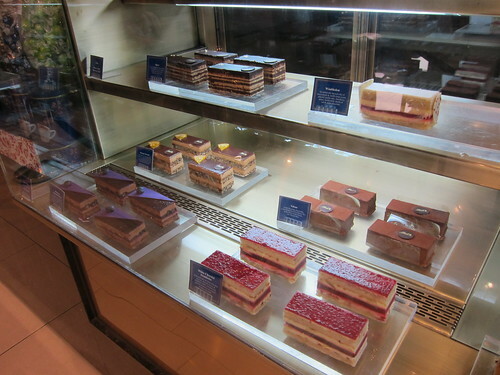 They are also quite a decent size compared with Cacao and Le Petit Gateau which are a little on the small size for a similar price. Their cakes also looked quite appetising but it was 11am and after already ordering macarons, it probably wasn’t a good idea to order a slice. 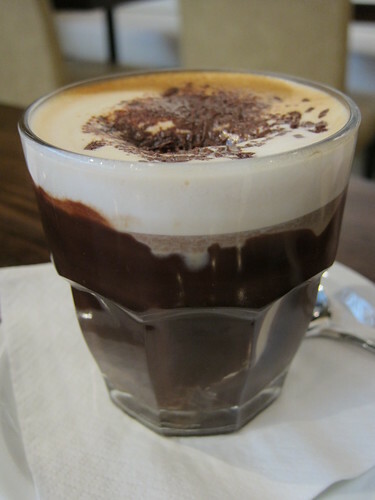 I had a Mocha, and boy is it chocolately good. Might be a bit too sweet , had to add a bit of hot water into it and it was perfect. Check it out if you’re shopping there. 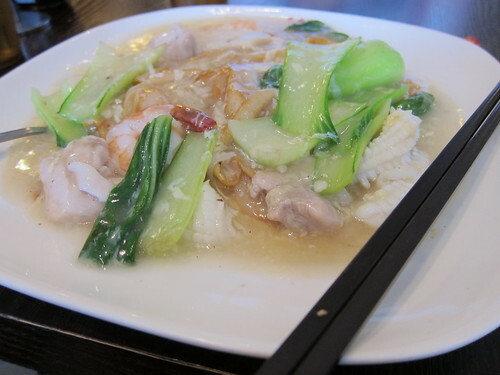 Claypot King in the bustling Kingsway street, Glen Waverley is another popular Malaysian and Chinese eatery. I believe there is one in the city too, with a slightly different menu. 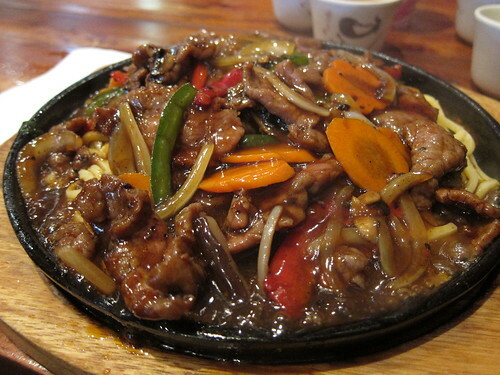 One of the best things about Claypot King is their sizzling dishes. Which I just had to order of course. 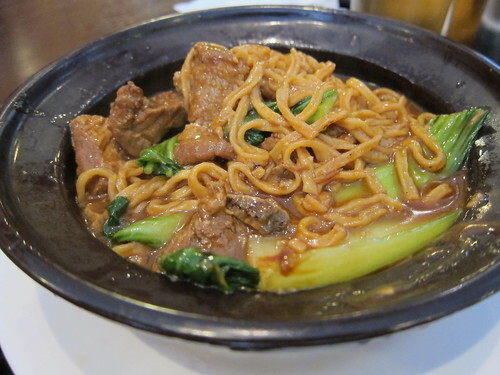 I ordered the Black Pepper Beef Sizzling Noodles. I’ve ordered the Salmon one before, which was good but the salmon wasn’t that flavoursome so I didn’t really want to eat it again. 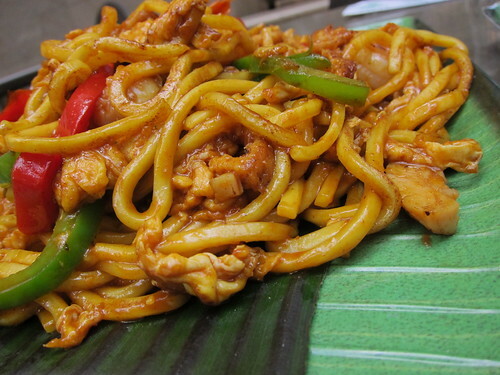 Although, it was still nice, just that black pepper is always good in anything. I love it when it arrives and it is still crackling and sizzling about. It’s just one of those cheap thrills. 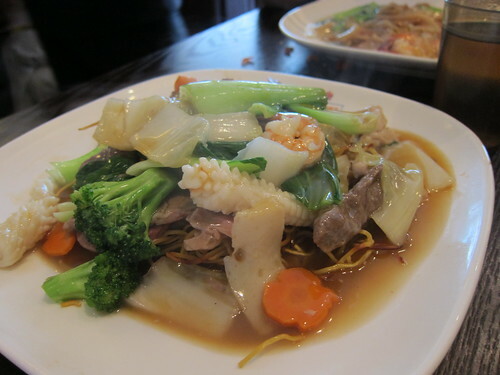 This dish had a pretty strong black pepper taste and combined with capsicum, Hokkien noodles and loads of beef. It was just an overall pleasant and tasty dish. However if you don’t like to have a black pepper overload, this is probably not the dish for you. 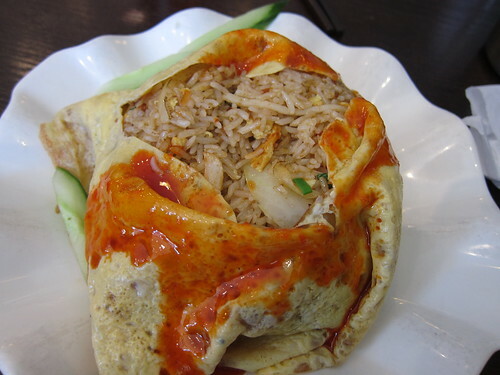 I’ve tried their Thai Fried Rice and that’s a pleaser too! 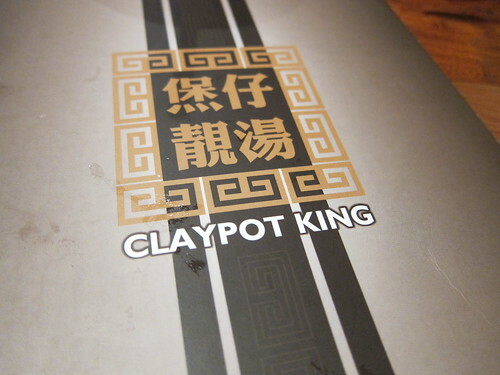 Claypot King is definitely a eatery you’d want to go back for. 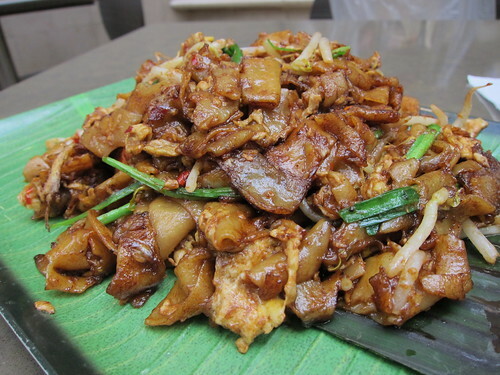 Mind you, it’s slightly more expensive then the other Chinese/Malaysian eateries on Kingsway.